Before June comes to an end, I thought I should find time for a few garden photos. The weather here this winter and spring has not been good for plant life, so apart from the odd flower or three which are blooming, we have not been blessed with what I would call a mass of colour! 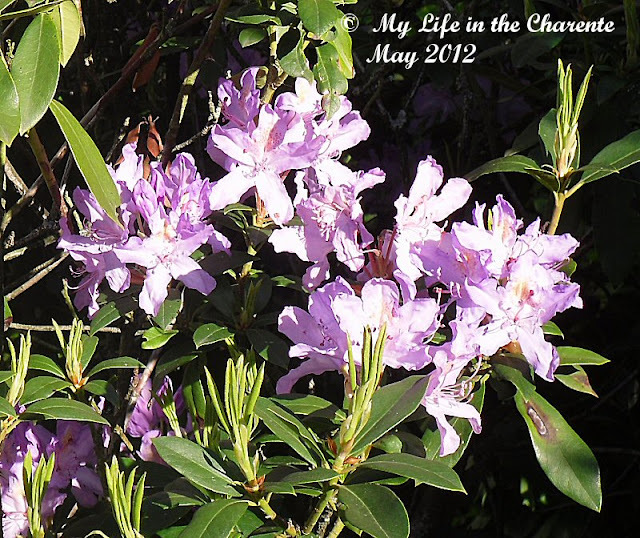 The flowers are starting to pick up, as you can see in the pictures below. As far as garden produce is concerned, the bad winter, plus the late frost when we were in the UK in May, has set everything well back. A handful of cherries this year meant no jam or fresh fruit, BUT, I do still have one drawer full of frozen cherries from last year, so clafoutis is still on the menu :-) Of our four plum trees, only the one which is protected by a large oak tree seems to have fruit on at the moment. The two fig trees were badly burnt by frost and are only just beginning to recover; only time will tell whether we will get any fruit this year. Not one quince on the quince tree; last year, it was so laden with fruit that the weight broke a large branch off. The medlar tree has fruit on it, but we have yet to try this unusual fruit, as we have never been here at the right time of year to harvest it. The hazelnut tree is loaded and obviously the cold weather suited that, if nothing else. Now we just have to hope that the nuts are not wormy!! After yet another disappointing year for the asparagus, we bit the bullet and dug up two of the three rows. The last row now looks hardly worth keeping, so that will no doubt go as well! The removal has created much needed space for more productive species! As for the tomatoes, peppers etc, the plants are still small and have a long way to go. The onions do not look too bad and we are digging our first potatoes. We will be able to dig the garlic soon and see just how good that is. Some chard planted in a flower bed near the house also seems to be quite happy and we are picking leaves from that. A few green cherries in May before the final frost took its toll. I moved this lily from the garden in the UK. I didn't plant it originally, so I am not sure which variety it is. I am glad that it has moved over to France and it is still happy. See the little fly on the right petal? I am told this is Michaelmas daisy; it is one that just appeared from the mixed seed packet that I threw into the bed last year. 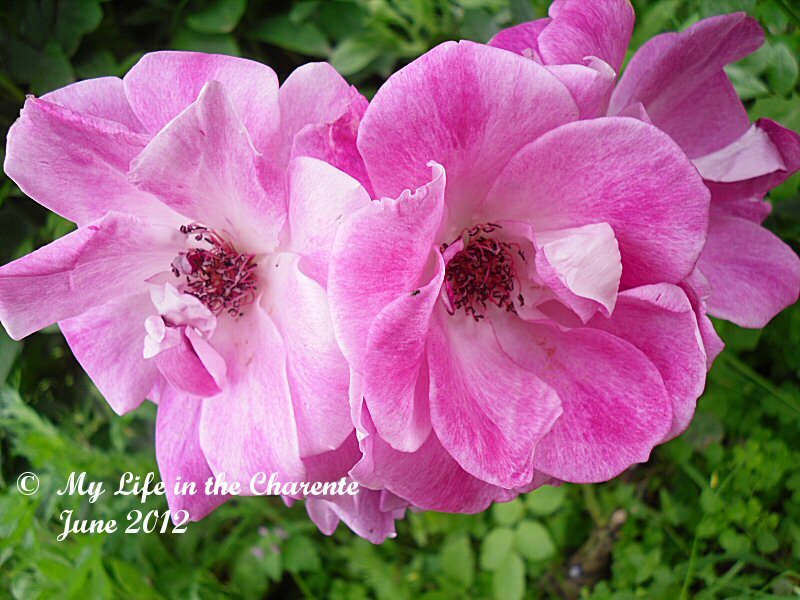 This is a climbing rose that a friend gave us earlier this year. So far it has done little climbing, but it is at least flowering! These English marigolds seem to be completely different from the marigolds that I know here in France and South Africa, which have a very strong smell. The latter are good planted between tomato plants to keep the greenfly away. 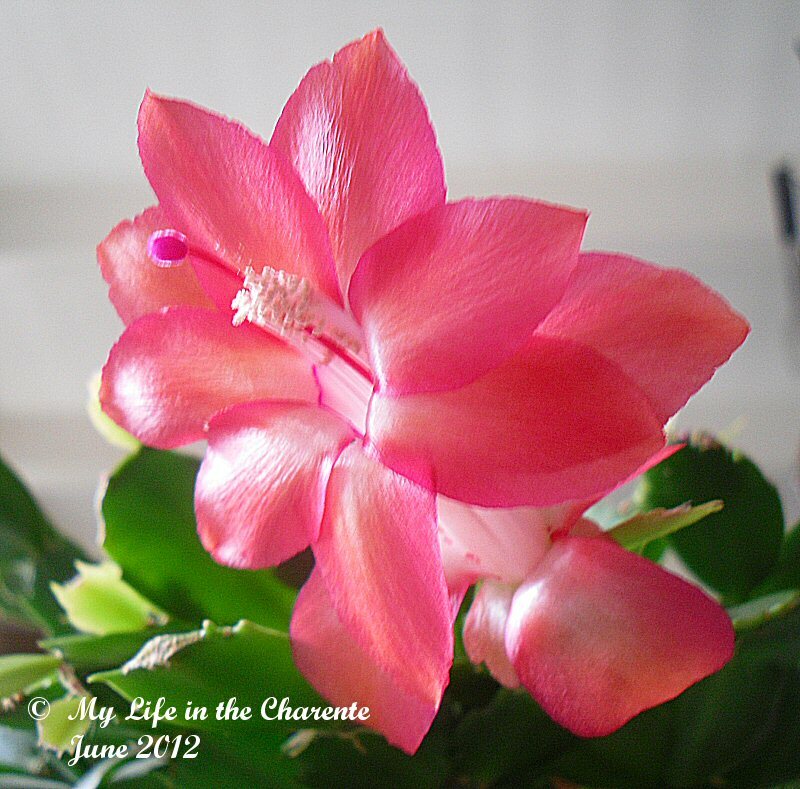 I have no idea what the Christmas cactus is doing flowering again now indoors, but I was more than happy to see its lovely flowers. Love-in-a-mist; these have just reseeded from last year's crop. 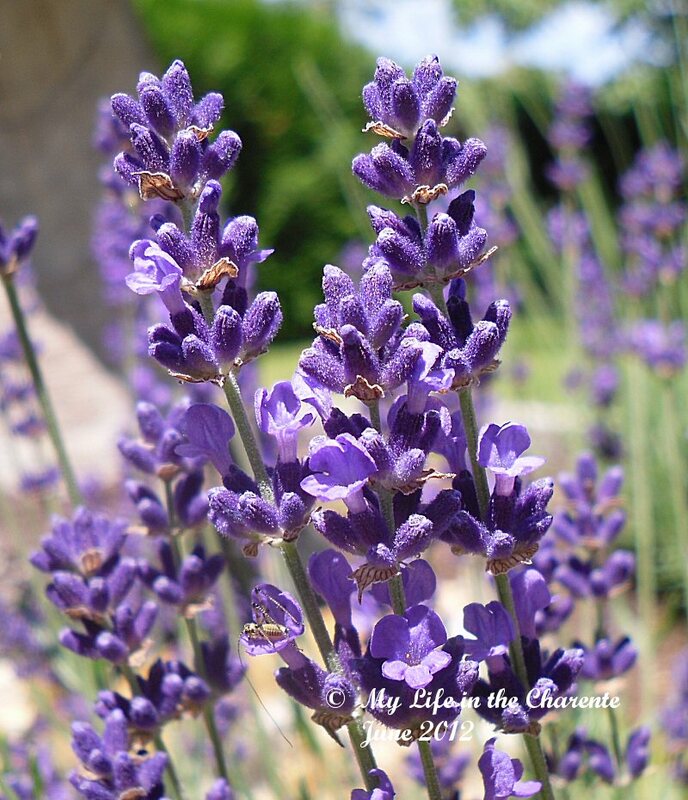 The lavender is only just coming out; I hope the butterflies will soon be here now. Can you see the little 'hopper' ? 10 o'clock from the © copyright logo! The hydrangea flowers are just coming out. 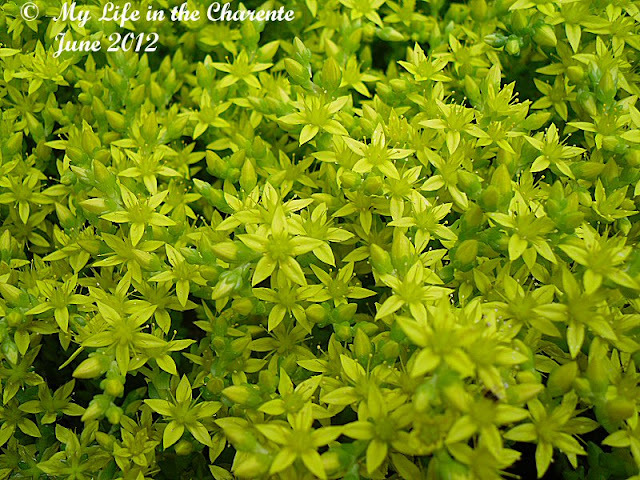 Sedum anglicum; this is a succulent and a ground cover that I just love at this time of the year. 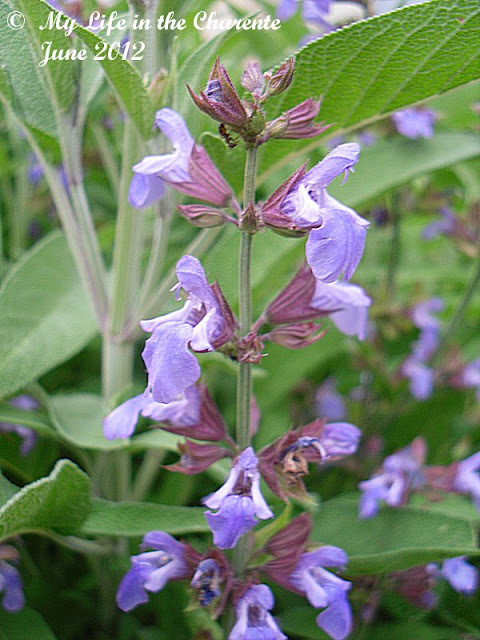 I cut back the three sage bushes after heavy damage during the cold winter and they now seem to be bigger than ever, with these lovely blue flowers. Last but not least, Forget Me Not. 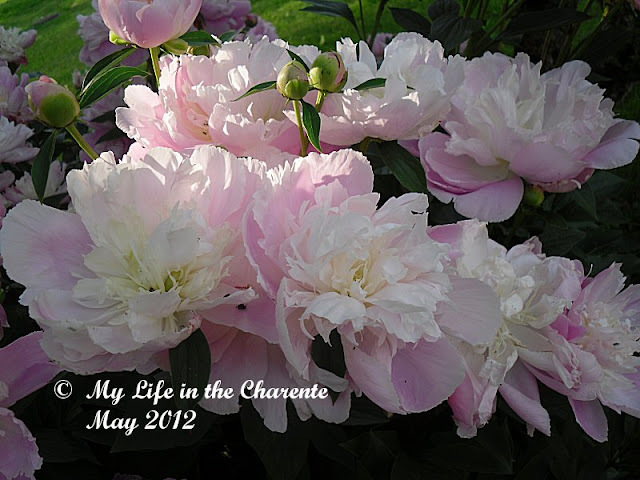 You might also like My Life Before the Charente updated 18 June 2012. Wow! These are some amazing flowers! Our backyard doesn't look anything like this. I'll show my kids when they wake up as they could use some inspiration for their flower beds. ANd thanks for stopping by earlier! Have a great week. You do still have a lot of colour in your garden Diane, despite the adverse conditions .... i love the pinkish lily you brought from the UK. ... errmmm what is 'clafoutis'? All your flowers are beautiful and no doubt the rain has helped them grow even if it hasn't been as good for other plants. Thanks for sharing your beautiful flowers in all the wonderful colours! Graham I also like the Lily, I am glad it made the move OK.
All things considered, your garden looks great Diane and your photos are fantastic. Here in the mountains this winter we hardly had a winter at all. It felt like spring started in January. It's interesting the flowers we have in common - rhododendron & hydrangeas for sure. 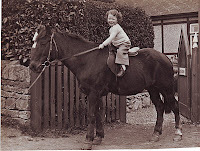 I could have taken those photos in my own garden(smile). Stephen I answered your comment earlier but I have just noticed that it has gone AWOL!! Hi Diane, thanks for sharing all the beautiful flowers from your garden. All the flowers are really gorgeous and excellent especially the Love-in-a-mist and forget me not. Lovely blue color! Generally speaking it really does seem to have been something of a disappointing season over large parts of Europe. We are particularly sorry to read that your cherries have not done well as we have, for the last week or so, been enjoying the most wonderful ones here. And next week Tímea will make the very traditional cold cherry soup. But notwithstanding, the pictures you show of the plants flowering in your garden suggest that it must all be looking very pretty. Jane and lance I am glad to hear that you have cherries there. I have never made cherry soup, but I have just looked up a recipe for Hungarian cherry soup that looks delicious. I see no reason why my frozen cherries will not work :) We just need a warm day to enjoy it! Judging but these great photos, your garden must be blooming indeed! And it will keep looking better as the seasons evolve! I can only imagine the work that you've into it!! I feel like I just had a lovely retreat in your French garden! Love all these photos, I think if I were you, I'd sit int the garden all day! Looks like you have quite a few flowers blooming. Bummer about the edibles being frosted. Hello Diane, despite the weather and adversities your garden seems to be doing well. Sorry about the quince but you'll have plenty next year. Have a wonderful summer. Some beautiful flower photographs, Diane. At least if you are not picking, preparing or cooking the fruit you gave more time for the vegetables! despite that you didnt get a good harvest, the flowers are all so pretty..and hope your hazelnuts are good! i just love seeing the hydrangea and the lavenders, they always look so romantic to me! Your garden photos are always so lovely Diane. Un jardin magnifique. Tes fleurs sont très belles. You have gorgeous flowers in your garden Diane! I just bought a new white Hydrangea so I hope it does well:) Have a lovely week! 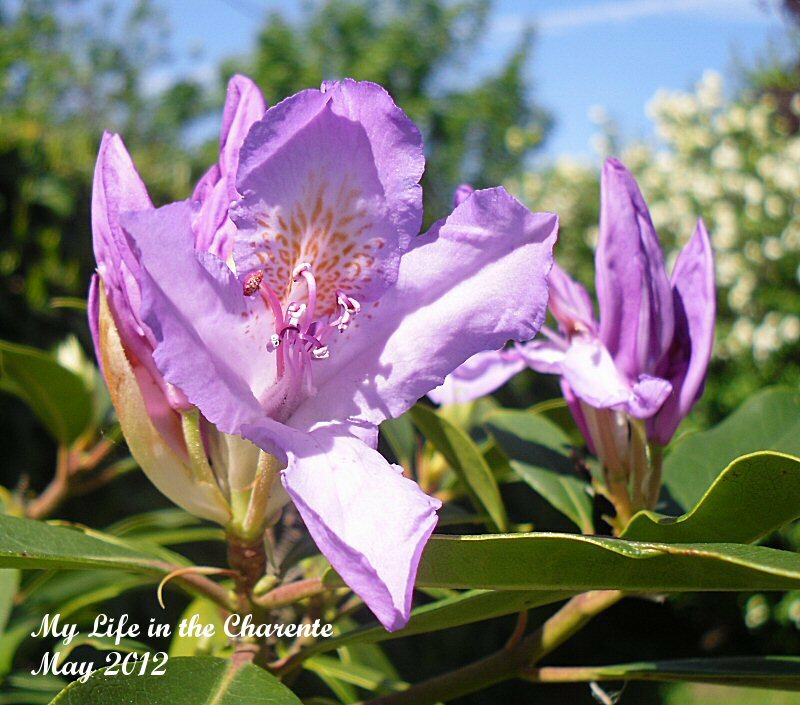 It has been lovely to see your post and all the beautiful photos of the flowers in your garden. What a fabulous place to live! It's a shame about the asparagus but I think it is eminently sensible to give up after a while and plant something more productive as you have done. Boy....they weather all over is so weird now....that one never knows what will grown and bloom or what won't. Your flowers are looking very lovely I might add....and I 'm pleased you were able to retrieve a few veges. It has been a while since my last visit.. 2 weeks off from blogging..
Hey, the Rhododendron... we have those also in Malaysia.. We call it Bunga Senduduk.. the Hydrangea is Bunga Kembang 3 Bulan..
Diane, my computer automatically blocks pop up windows, so I don´t see what you referred on your last comment. Why don't you try blocking that URL? Maybe it would help. I imagine how annoying this might be... Sorry. 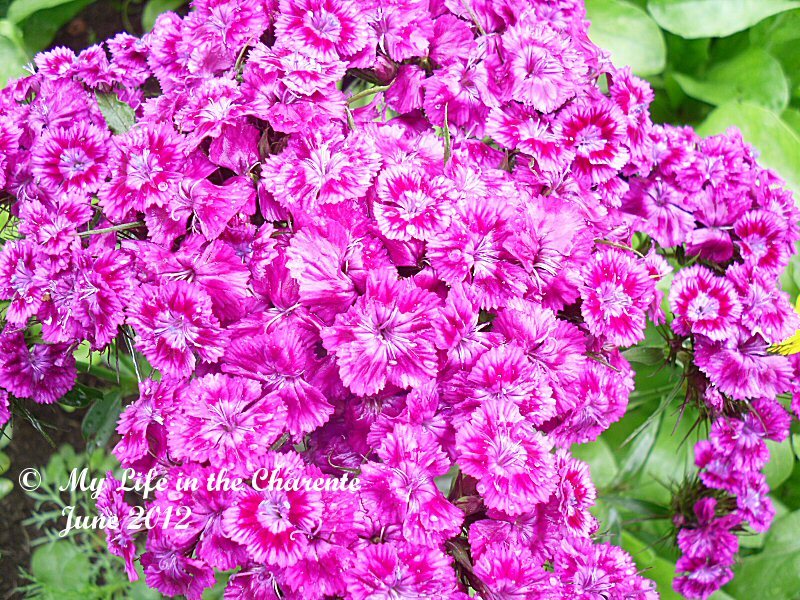 Gorgeous flowers and photos, Diane! 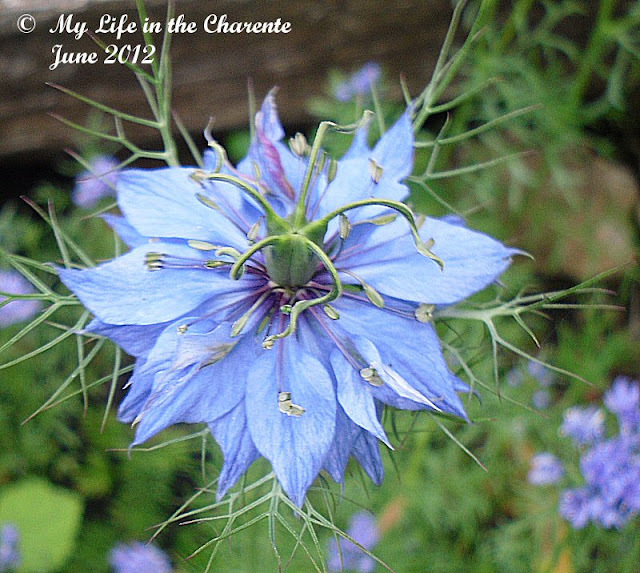 The love-in-a-mist is so delicate looking and pretty. I've never heard of that one. 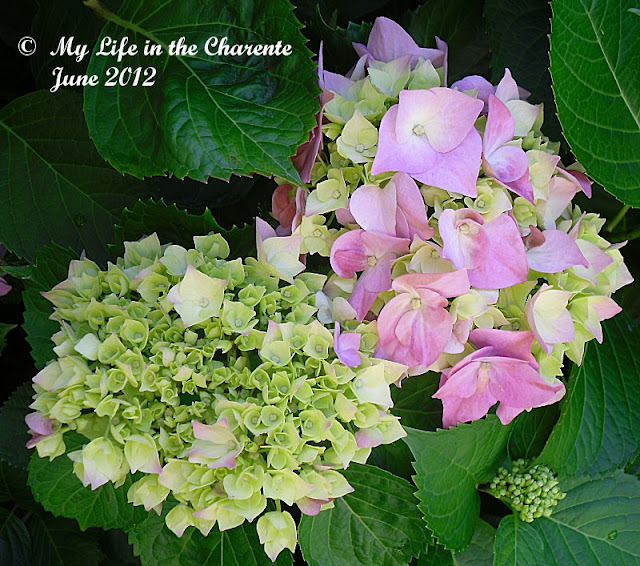 My hydrangeas are blooming now also and one side of one bush has blue flowers and the other side has pink flowers--guess the soil is a little different for some reason. We desperately need rain though as it's so very hot here now. I just planted butterfly bushes and Chinesespice bushes so need some rain for them! Too bad about your cherries and asparagus. Gardening is full of mysteries sometimes but the rewards are wonderful when everything "grows good." I love your new blog design especially the header! Your garden must be full of bees buzzing around with those beautiful blooms! Still lots of colors...Fingers crossed for you that you will soon experience the bounty of summer. you should come and see (and enjoy yourself creating something from scratch) our yard ! obviously you have never seen any pictures !! Dolly I can imagine, I could see that England was behind us when we were there. The weather seems to have messed everything up this year!! Amazing photographs! Your garden is weeks ahead of mine. I think that we shall have to hope for an Indian Summer. Wow, you have some amazing flowers in your garden - lots of wonderful colours. It is a shame about all of your fruit and veg - maybe they will just be a wee bit late this year. Dear Diane I love tour garden and in this time look georgeous all these flowers beautiful. oh your flowers are so glorious! my goodness, the colors are fabulous! good for you!! raisingahappyfamily-momof8, thanks for your visit and comment, also for following. 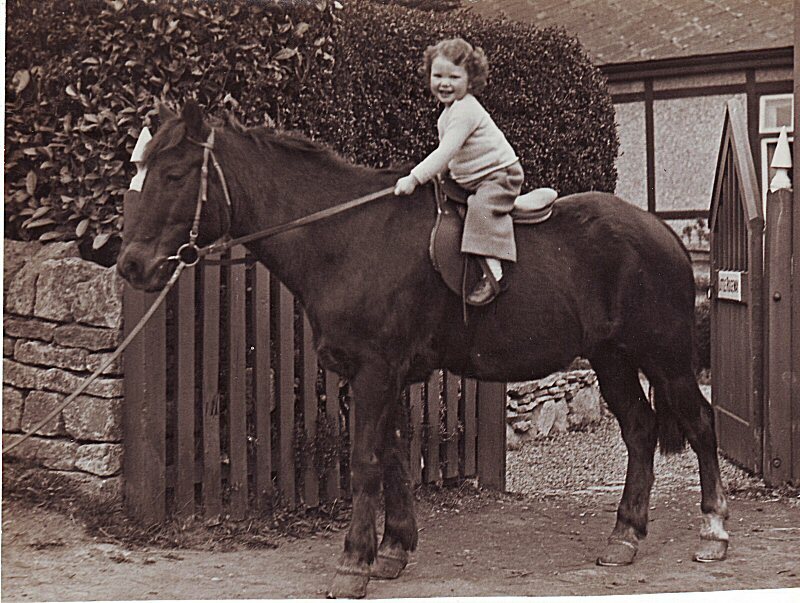 At last I am calling by to compare gardens which I know we always both enjoy doing. Interesting that although summer was also late arriving here this year, that we are ahead of you this season. 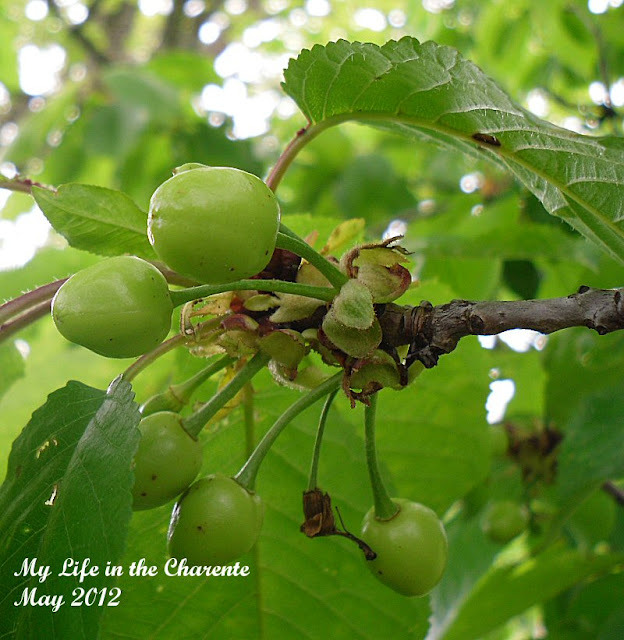 Our cherries were also disappointing,loads of them but not even fit for jam making or freezing as they tasted mouldy. The other variety was ok to eat off the tree but not enough to freeze. 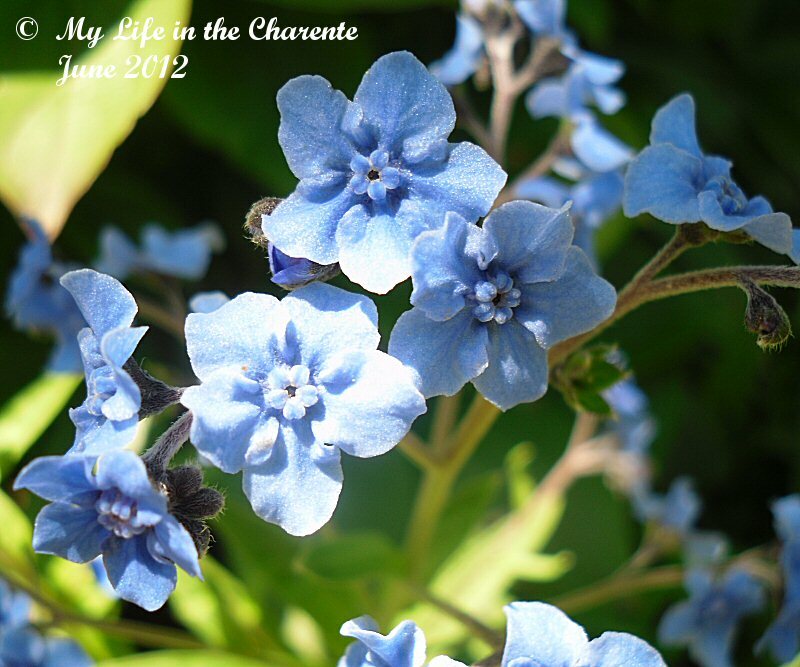 You may feel you do not have many flowers but you have still shared some beautiful colour with us, love the blues. 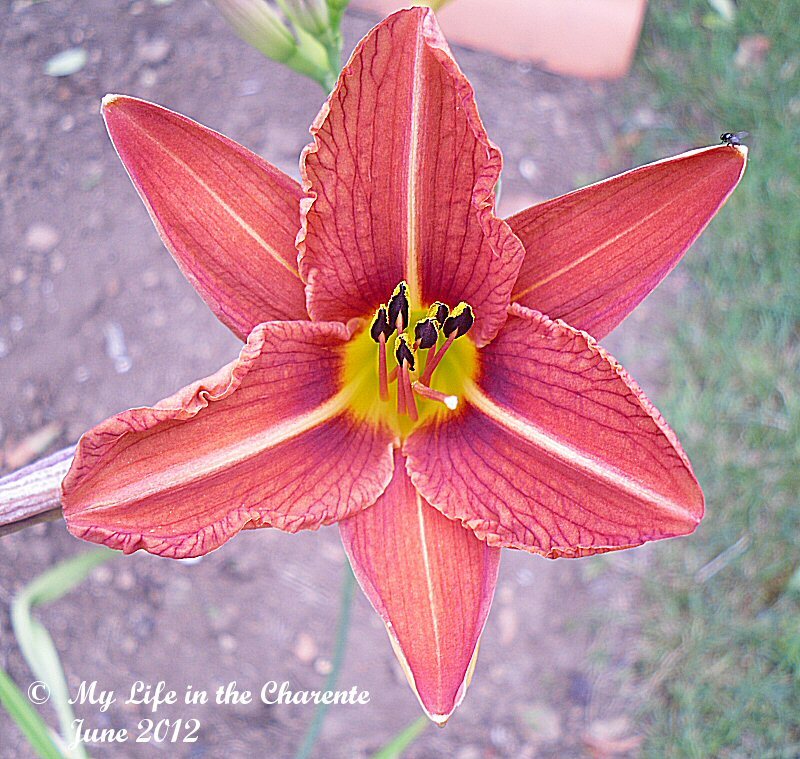 The fruits and veggies in your garden may not be doing well but the flowers are absolutely gorgeous. Thanks for sharing. Linda the fruit really is a disaster this year, apart form the hazel nuts and one plum tree which has a few plums there is nothing, oh yes, a few apples but they do not look very good. Your garden is a real dream. I always look through the posts about the plants that you've grown, with so much interest. Your garden displays the fruits of your labor with its array of delightful flowers (and tomatoes to come!) Our gardens are filled now with annuals, caladiums, red salvia, begonias and lots of hydrangeas... love the garden! These pictures are stunning! look really beautiful! Je ne me lasse jamais de voir ces belles fleurs si bien photographiées.Le jardin est toujours un enchantement! Hi Diane .. the weather is really strange - the asparagus over here has been poor this year .. and I hate to think what they're going to do about strawberries for Wimbledon!! Actually a great deal of stuff is now being grown under plastic - so perhaps all will be well .. but mildew in abundance is around ..
Beautiful photos .. the cherry one is spectacular .. I am getting some American cherries - for some reason I prefer their taste .. Your garden blooms are just lovely. 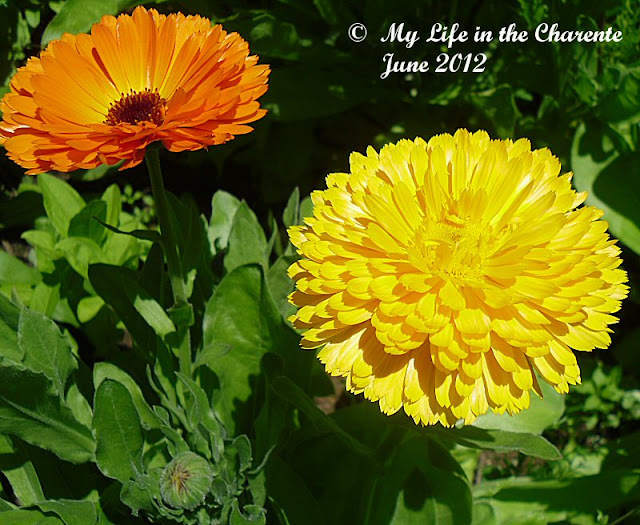 I need to get some marigolds planted in the tomato garden...totally forgot. Thanks for the reminder. mellissina2 Köszönöm a látogatást és a hozzászólást. Kerry it looks like we have a week of no rain ahead, so yes we can enjoy the garden and some cycling. I took it easy yesterday and only did 23 kms going to get some oysters at La Roch but Nigel did 40kms in the afternoon. I love looking at your garden, and beautiful flowers Diane. I would like to see them from a distance in your yard too. Enjoy your weather. We've had a lot of rain from TS Debby...just sat out in the Gulf of Mexico raining on us. She did take care of our drought though! Hi Diane, have missed quite a number of your post. Gosh, what a spring! And thanks so much for showing me the green cherry. I have seen the red & black ones but not the green. Merci pour vos commentaires sur mon blog. Salutations charentaises.